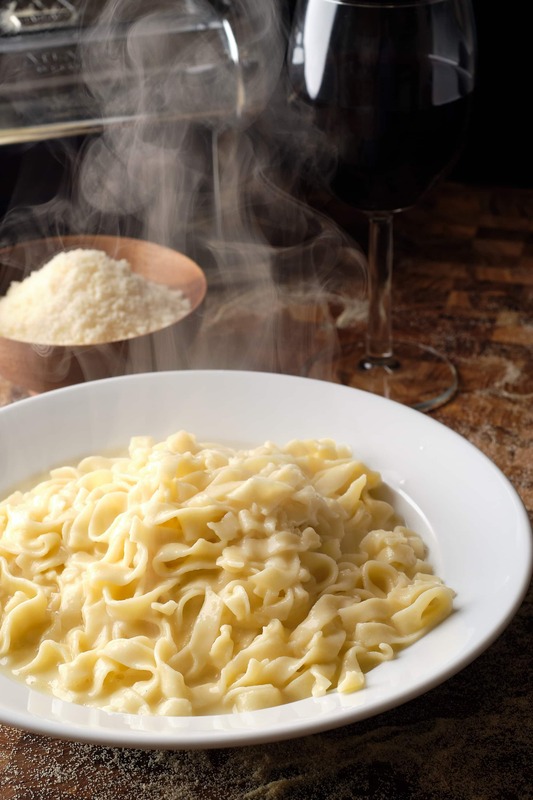 Semolina Flour, Water, Salt, Parmesan Reggiano, and Butter are the only ingredients you need for Authentic Fettuccine Alfredo From Scratch. There’s no need for eggs in your pasta or cream in your Alfredo sauce. Whether it’s for bread, pasta, or pizza, there’s nothing I enjoy more in the kitchen than working with dough. I’ve been working on this recipe for a few days along with a round loaf bread recipe. I’m totally carbed out. I think it’s safe to say that most Americans think of Alfredo as a rich cream sauce served with pasta and chicken. That’s not actually the traditional type of Alfredo sauce. Alfredo sauce is made simply with butter and parmesan reggiano. I know – it’s surprising that Italian food is actual made with simple ingredients. 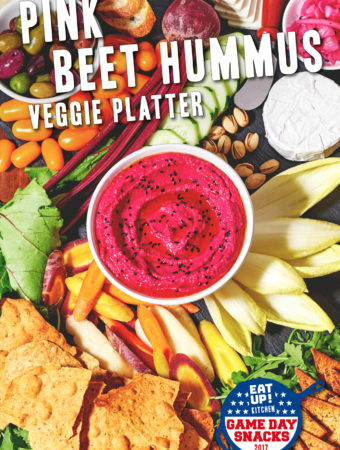 Just because something is packaged and sold on a grocery store shelf doesn’t mean you can’t make it at home. In most cases, you’re probably better off making it at home for the cost and health benefits. You could open a cardboard box of dry pasta and crack open a jar of white goop and call that “Fettuccine Alfredo” but I promise you it won’t taste as good as making everything from scratch. And honestly it doesn’t take much more time at all. This fettuccine recipe is now one of my favs. I’ve made fettuccine for Homemade Fettuccine and Clams before but that was with eggs. I’ve never been 100% on board with using eggs in pasta though. They taste a bit too much like ‘egg noodles’ – which is great for serving a beef ragu over but doesn’t taste like Italian pasta to me. Happily, this is way easier pasta to make than anything with all purpose flour and eggs. The recipe is 2 parts semolina to 1 part water. That’s it! Pasta is a simple ratio of 2 parts Semolina Flour to 1 part Water. For 1 pound of pasta use 300 grams Semolina and 150 grams water. 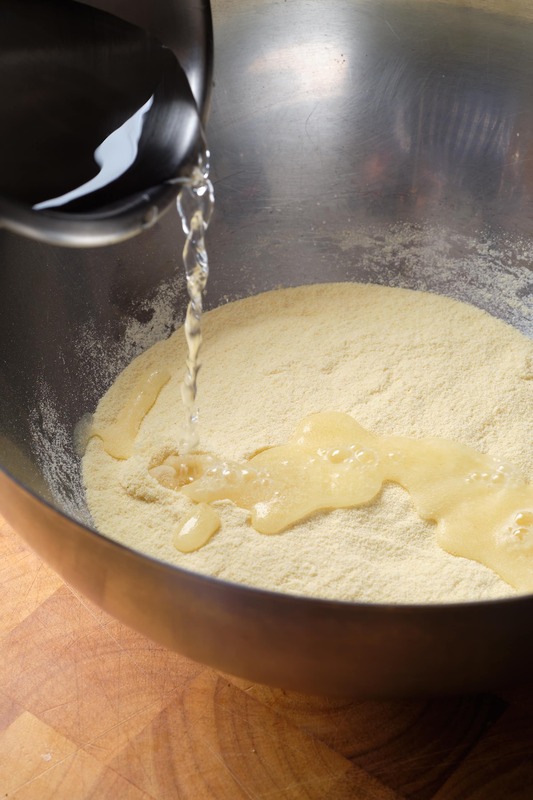 Fettuccine from scratch – add water to semolina in a large mixing bowl. Fettuccine from scratch – use a wooden spoon or silicone spatula to work the flour and water together. 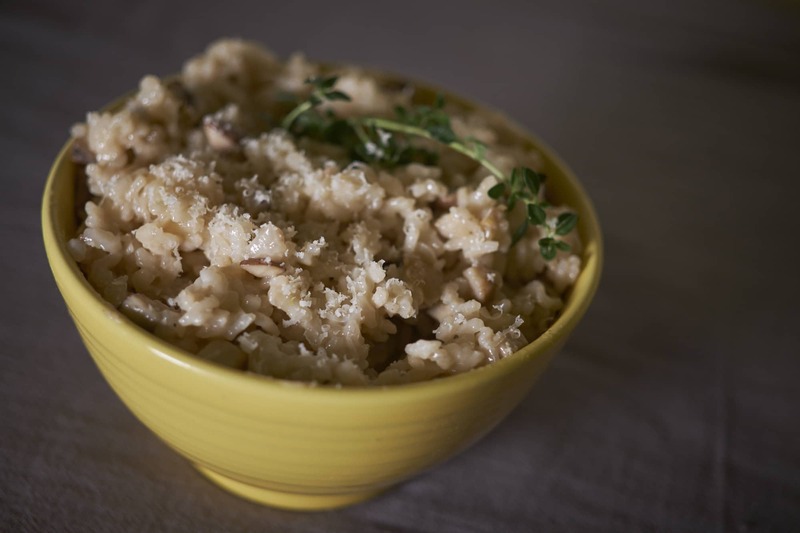 If you’ve been making your pasta with white flour and eggs I hope the one thing you take away from this post is the 2:1 semolina / water recipe. 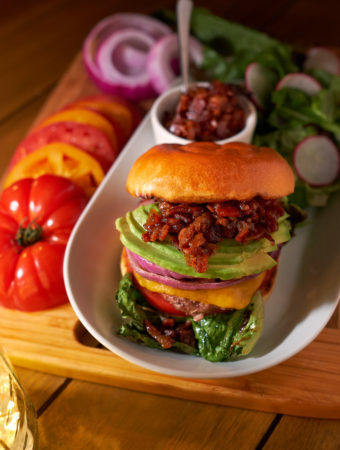 It’s easier to make, easier to remember, tastes better, and lasts longer. Semolina is just flour made from a Durum Wheat. This wheat is harder and has less workable gluten than regular wheat so you end up with pasta that tastes more like pasta and less like noodles. When you add the water to the semolina you might think this isn’t going to work. The water seems to bead off of the flour. Trust me, it won’t take long for the flour to become hydrated once you start to work it with a spoon or spatula. As it comes tighter you can turn it out to a clean work surface and start kneading it. This only takes about 5-6 minutes of kneading. Really, this dough is a lot of fun to work with. It turns from rough and sandy to smooth and tacky in such a short period of time. 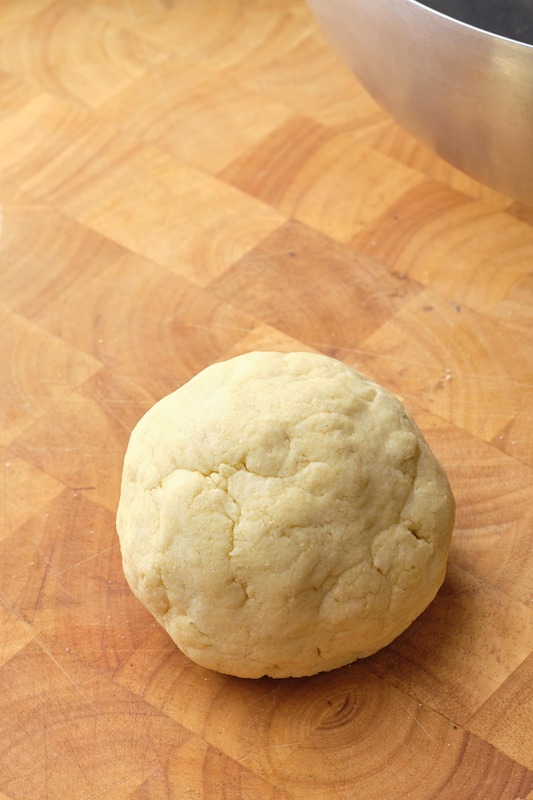 Dust the dough ball with a bit more semolina and wrap it in plastic. Chill for 30 minutes at least for it to fully hydrate and relax. The colder dough is much easier to work with too. 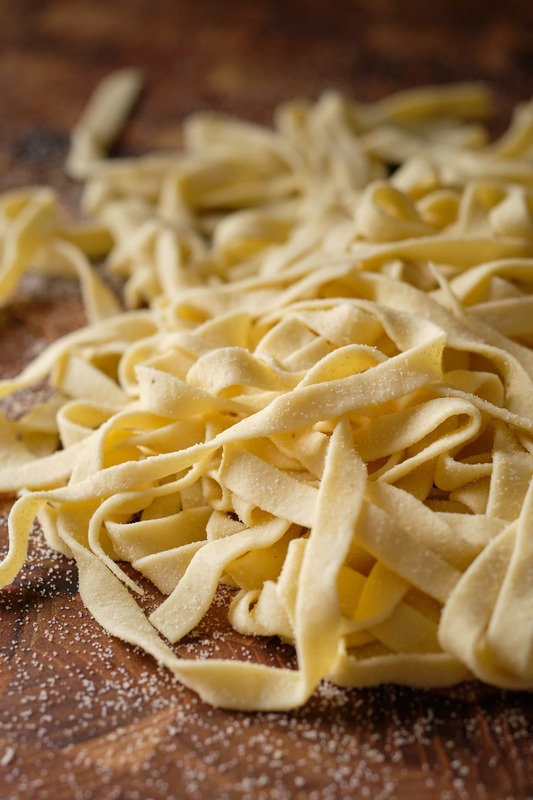 Fettuccine from scratch – once the flour is hydrated you can transfer it to a clean work surface for kneading. 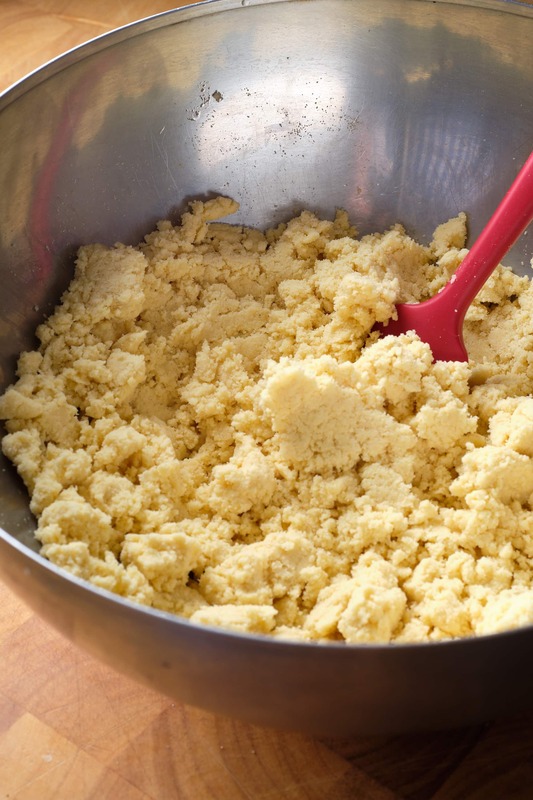 Fettuccine from scratch – your pasta dough should look like this to start with. Fettuccine from scratch – knead pasta dough for 5-6 minutes until smooth and tacky. Dust with semolina, wrap in plastic, then rest in fridge for at least 30 minutes. 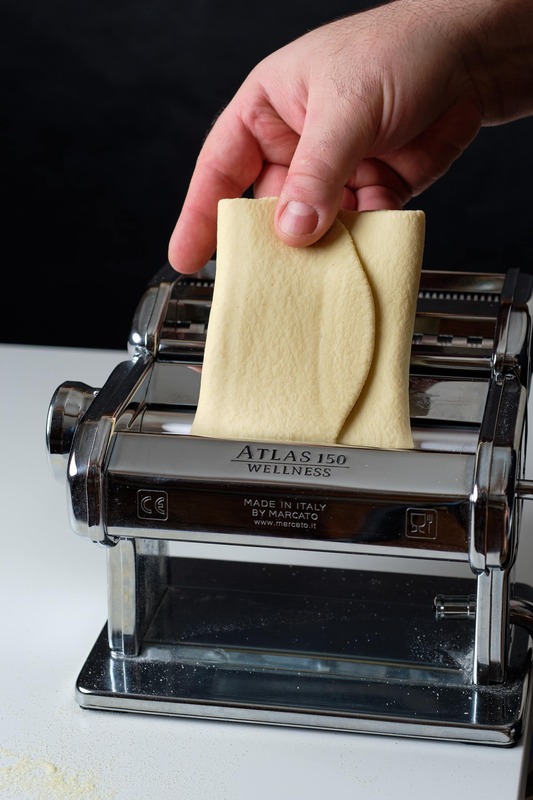 Flatten the dough with your hands and pass it through “0” on your pasta machine. Fold the dough in thirds, turn sideways, then pass through “0” again. Repeat 2-3 times to laminate the dough. 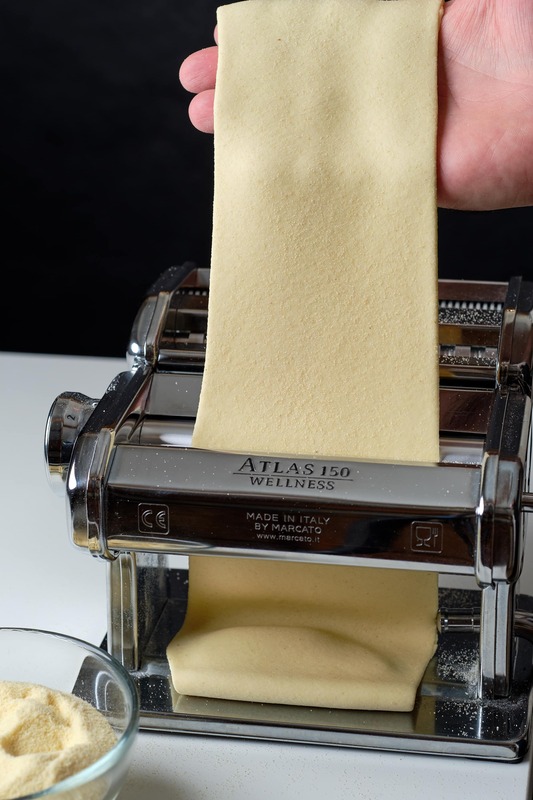 Pass the pasta through the roller settings one at a time until you get to 4 or 5. Cut the pasta in half if it’s too long to work with. 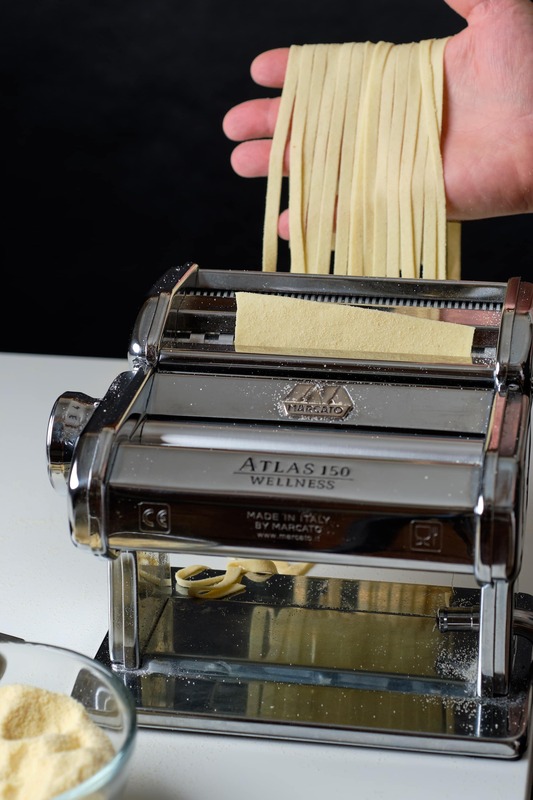 Roll the pasta through the fettuccine cutter then set aside until needed. This recipe makes one pound of pasta – if you cut the dough ball in quarters and roll it out you should have 4 individual portions. Eggless pasta should last quite a while at room temp but you can extend the shelf life by keeping it in the freezer. 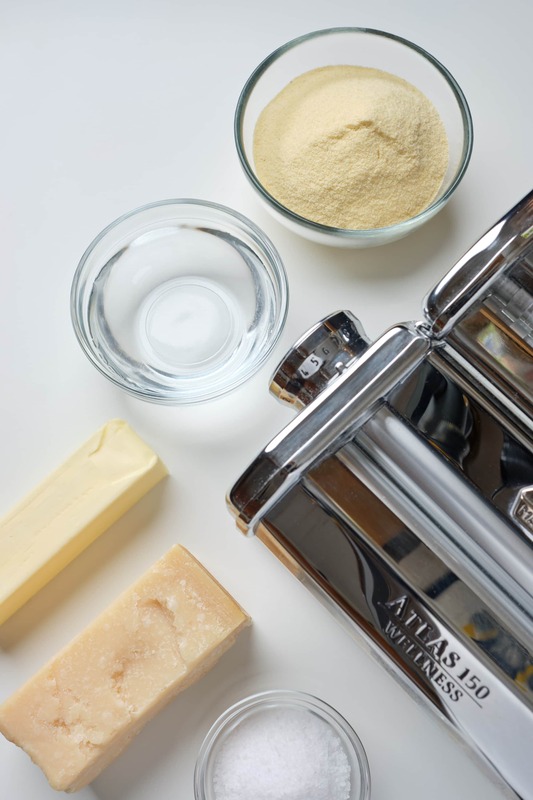 As you work with the dough in the pasta machine you’ll want to keep it dusted with semolina. Keep a half cup or so on the side as you roll the pasta through the machine. My dough was a little warm which means it was a little extra sticky – especially when it came out of the machine. This meant I had to dust with semolina with each pass through the machine. When the fettuccine was finally cut I also gave the nest of pasta a final tossing in semolina. The “Alfredo sauce” is comprised of butter and reggiano plus one more ‘secret’ ingredient – pasta water. The pasta water works as an emulsifier and as seasoning. This is an important part of the recipe so I tested a few different ratios of water to salt to boil your pasta in. My first test with about 1/4 cup salt to 6 cups of water, which is perfect for pasta alone, was too salty when added to the sauce. I settled on 2 tablespoons of Morton Kosher Salt to 6 cups of water. Once the pasta starts to foam in the pasta water you’re going to take out two cups of the water and add it to a pan with butter. Keep this pan on the back burner over low heat and whisk the butter and water together. As the pasta reaches al dente you can use tongs to transfer it directly to the pan with butter and water. Give it a shake to coat the pasta in butter water and add a handful of grated reggiano. Use tongs to toss the pasta as you shake the pan with the other hand. Add another handful of cheese and repeat. You’ll find the watered down sauce soon becomes a beautiful rich creamy sauce – without any cream! 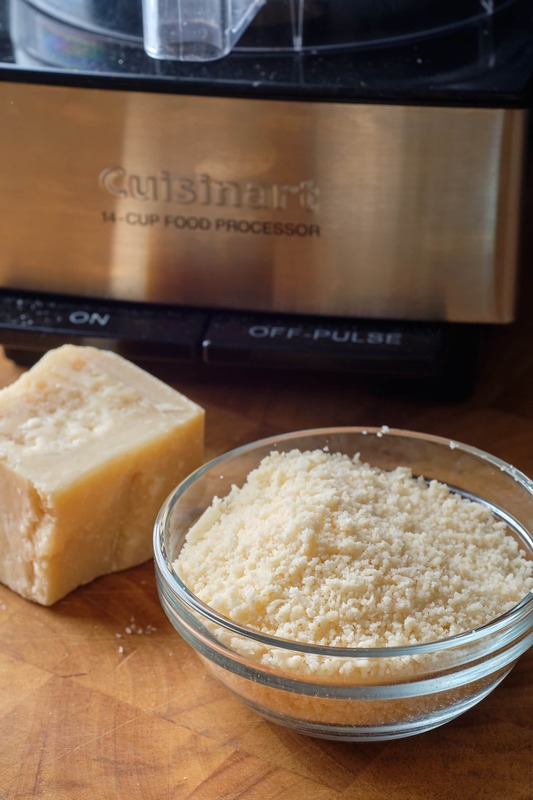 The best way to grate Parmesan Reggiano is to pulse it in your food processor. This takes less than a minute and you get perfect grated regg! 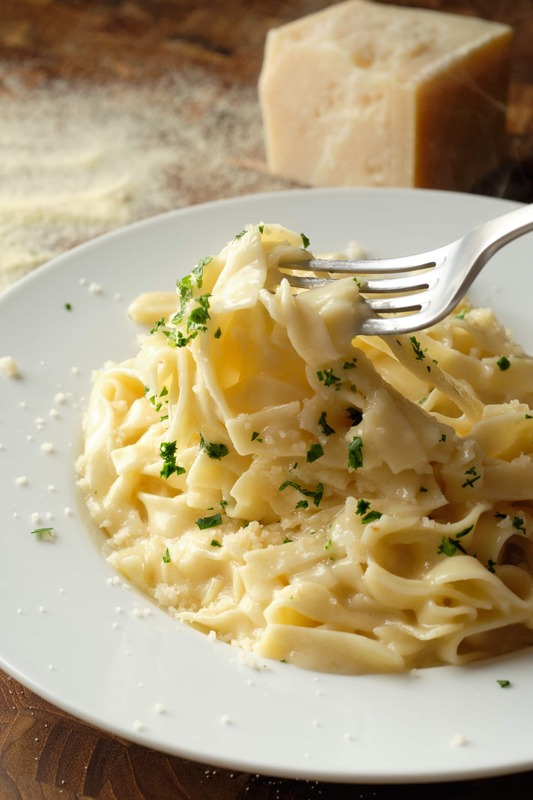 Fettuccine Alfredo is traditionally served only with extra Parm Reggiano. 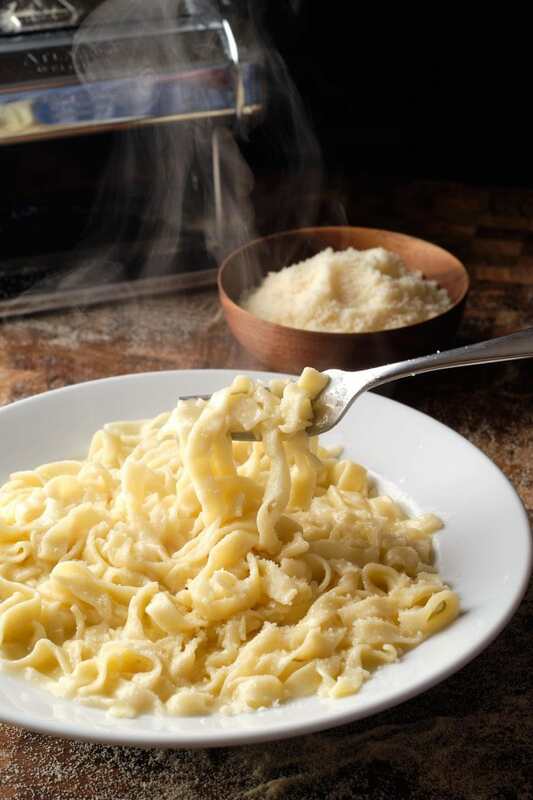 Buck tradition and add anything you want to your Fettuccine Alfredo! I like mine garnished with parsley and black pepper. Alfredo is great with grilled chicken and Italian sausage too! Semolina Flour, Water, Salt, Parmesan Reggiano, and Butter are the only ingredients you need for Authentic Fettuccine Alfredo From Scratch. There's no need for eggs in your pasta or cream in your Alfredo sauce. 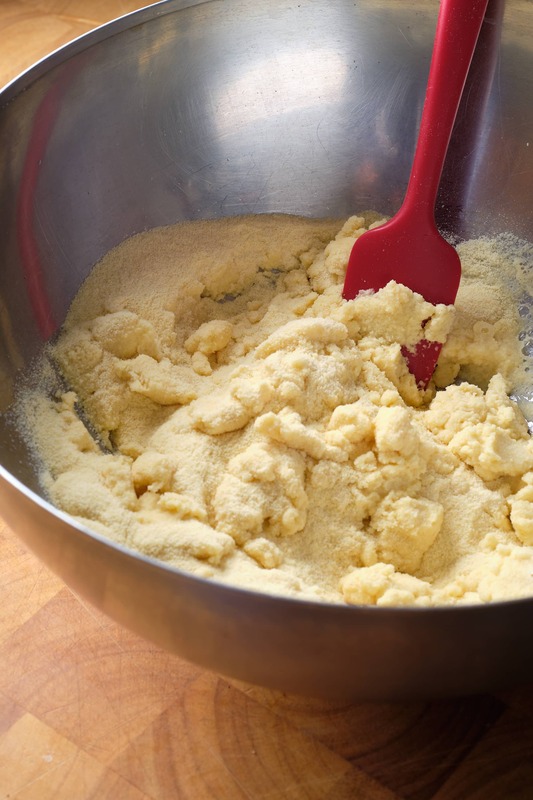 Combine Water and Semolina Flour in a large mixing bowl. 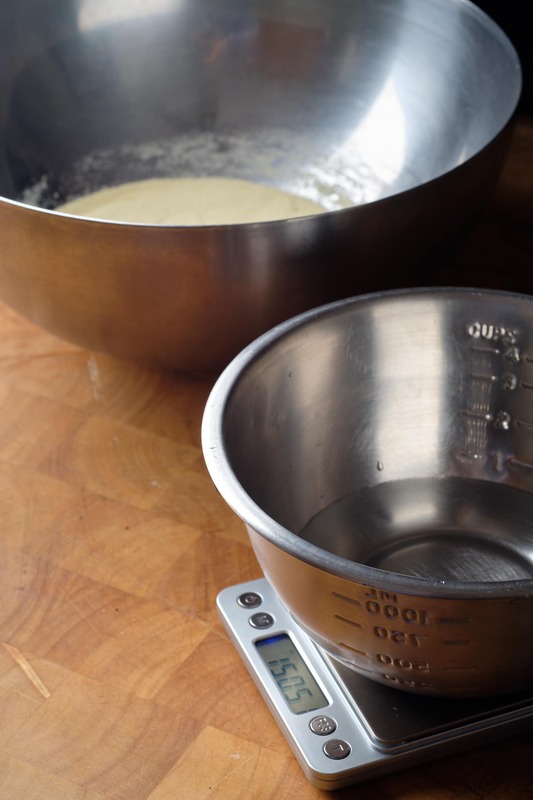 Use a wooden spoon or silicone spatula to combine until flour is hydrated. 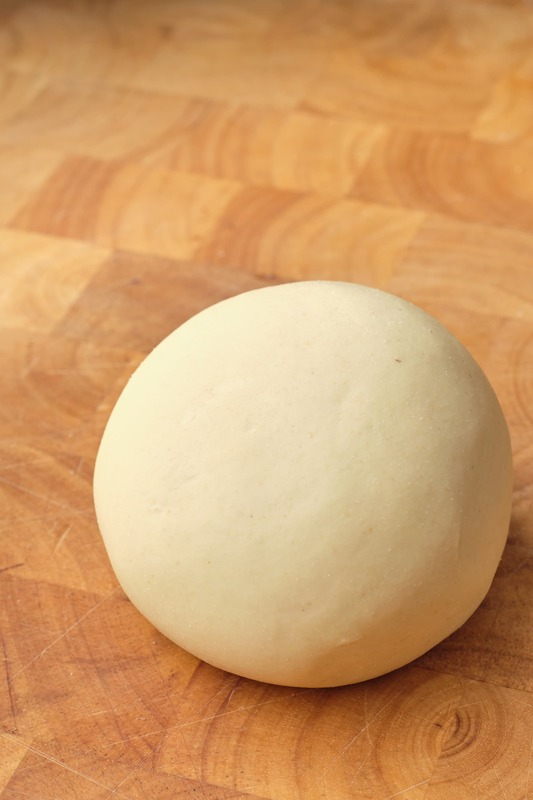 Turn dough out to a clean work surface and knead until a smooth ball is formed - about 5 minutes. Dust dough ball with flour and wrap in plastic. Chill for at least 30 minutes. 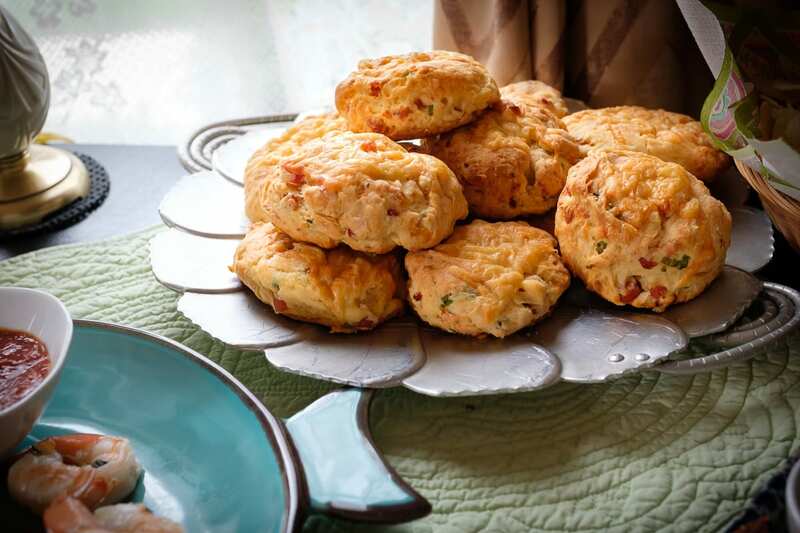 Unwrap dough and divide in to workable portions. Flatten in to a rectangle and pass through "0" setting on pasta machine. Fold dough in thirds, flip and repeat in "0" 2-3 times. 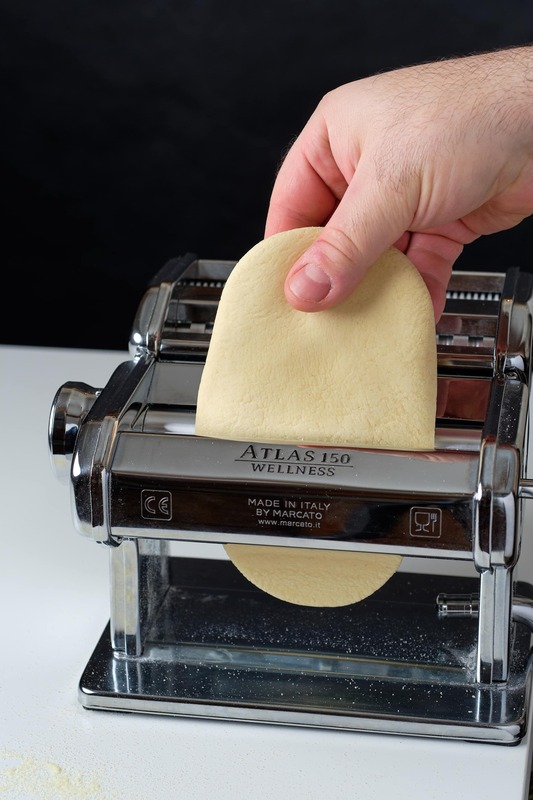 Process dough through each setting of the pasta machine stopping at setting 4 or 5 depending on desired thickness. Process pasta through fettuccine cutter then set aside until needed. Add water and kosher salt to a medium pot and bring to a boil. Melt butter in a large pan over a low flame. Add pasta to boiling water and stir with tongs to prevent sticking. As pasta begins to foam transfer 2 cups of the pasta water to the pan with butter. Whisk to combine. Cook pasta until al dente (about 4 minutes) then use tongs to transfer directly to pan. Shake pan with one hand as you add handfuls of Parm Reggiano to the pasta and toss with tongs. As each handful of cheese emulsifies in with the sauce add another handful. Sauce should be smooth and creamy.